Form R-5612 NPM is a Louisiana Department of Revenue form also known as the "Nonparticipating Manufacturer's Product - Schedule Of Cigarettes And Roll-your-own Sold Outside Louisiana - Non-louisiana Sales". The latest edition of the form was released in November 1, 2013 and is available for digital filing. 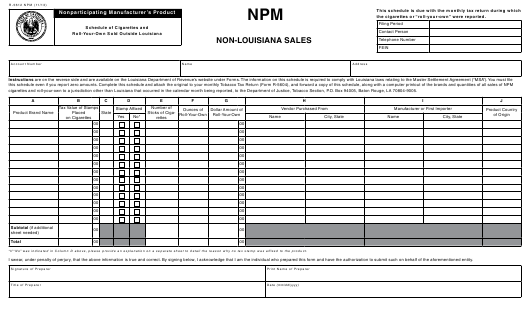 Download a fillable PDF version of the Form R-5612 NPM down below or find it on Louisiana Department of Revenue Forms website. the cigarettes or “roll-your-own” were reported. cigarettes and roll-your-own to a jurisdiction other than Louisiana that occurred in the calendar month being reported, to the Department of Justice, Tobacco Section, P.O. Box 94005, Baton Rouge, LA 70804-9005. *If “No” was indicated in Column D above, please provide an explanation on a separate sheet to detail the reason why no tax stamp was affixed to the product. I swear, under penalty of perjury, that the above information is true and correct. By signing below, I acknowledge that I am the individual who prepared this form and have the authorization to submit such on behalf of the aforementioned entity. The information on this schedule is required to comply with Louisiana laws relating to the Master Settlement Agreement (“MSA”). suitable for making cigarettes (“roll-your-own”) reported on the Tobacco Tax Return (Form R-5604) must be itemized on this schedule. reported, to the Department of Justice, Tobacco Section, P.O. Box 94005, Baton Rouge, LA 70804-9005. Louisiana AND affix tax stamps in both Louisiana and other tax jurisdictions. unlawfully brings cigarettes into the United States. being completed and does not include cigarettes or RYO purchased or invoiced during the month reported. means the country of origin listed on the packaging of the cigarettes or RYO being reported. transporting or receiving product in connection with a purchase. the destination in question without regard to where title was transferred. original PM as defined in the MSA. that the manufacturer does not intend to be sold in the United States. manufacturer unless such affiliate itself falls within any of (a), (b), or (c). Column A – Enter the brand name of the cigarette or RYO. Column B – If cigarettes, enter the value of the stamps placed on the packages of cigarettes. Column C – Indicate the state in or into which the product listed in Column A was invoiced. Column E – Enter the number of cigarette sticks for each brand listed in Column A. Column F – Enter the number of ounces of RYO for each brand listed in Column A. Column G – Enter the dollar value of each brand of RYO listed in Column A. Column H – Enter the name and address of the vendor from whom the product in Column A was purchased. Column I – Provide the name and address of the product manufacturer or the first importer of the product listed in Column A. Column J – Provide the country of origin of each product listed in Column A.